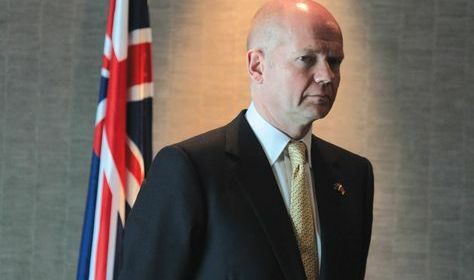 British Foreign Secretary William Hague and International Development Secretary Andrew Mitchell are visiting Benghazi in Libya to meet with rebels. British officials say the two will meet with leaders of the National Transitional Council including Chairman Abdul Jalil. They are also expected to meet with Libyan citizens in the embattled country. Hague said before the Saturday visit that it is meant to show support for citizens fighting the rule of Libyan leader Moammar Gadhafi. Hague is one of the highest-ranking officials to visit rebel-held territory. He arrived hours after NATO forces escalated the fighting with the first-time use of Apache attack helicopters.